So today I wasn’t planning on writing much. Maybe just six hundred words. However, my plans fell through for the night. I was planning on heading down to see some friends and grab some drinks. So I quickly grabbed some dinner at my favorite thai place and enjoy a spicy dish to warm me up. Wish I had a picture, but the mango ice cream here is to die for! Cooled my flaming tongue. I had written about five hundred words on the train ride home. After dinner (and some gaming), I sat down and fired off about seven hundred more words. 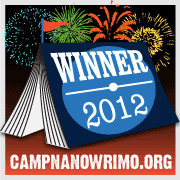 Not bad for the start of the second week of Camp NaNoWriMo! Seeing as I’m at a major point in the story for my male MC, I’m eager to write it. I might squeeze in a few hundred words, but tomorrow will be a major writing session. Lately I don’t even look at the screen anymore when I type. Sure it can be a bit messy, but I can still read it so editing won’t be painful. Keep on writing my friends!